On the road to settlement, a team of astute negotiators set up the Ngāi Tahu Land Bank – an arrangement with the Crown which gave the tribe the opportunity to ‘bank’ land that was surplus to Crown requirements in order to prevent it from being sold. This was an innovative solution which freed up Ngāi Tahu from the more costly process of High Court injunctions to stop the Crown disposing of assets that the tribe might otherwise want to use in a settlement. One of the major inclusions in the Land Bank was the King Edward Barracks site. At the time the site also included the Regional Headquarters Building of the New Zealand Police. Virtually the whole balance of the site was occupied by the Barracks building, a vast curved-roof structure supported on huge, engineered steel trusses which created Christchurch’s largest covered open space. For some, the connection to the site is with the army barracks that were constructed in 1905. It took just 25 working days to complete and featured 21 latticed, curved steel girders supporting a corrugated iron roof. It was used not only for drilling soldiers but also for civic functions and social occasions in the absence of a town hall. Our own kaumātua Charlie Crofts learnt to salute here! But long before its association with the army barracks, the site was always a place where people gathered – to collect food, to trade, to provide a warm welcome, and build relationships. Several hundred years ago, Puari Pā was first established by the Waitaha people on a large island-like area between what is now Carlton Mill Corner and a loop in the river near the King Edward Barracks site. Successive migrations saw Ngāti Māmoe settle at Puari before spreading further south and by the late 17th century Ngāi Tahu had settled in Canterbury. Once Kāiapoi Pā was established by Ngāi Tūāhuriri chief, Turakautahi, Puari became an important trading post and mahinga kai area. Pita Te Hori was the first Ūpoko Rūnanga of Ngāi Tūāhuriri and a defender of Kaiapoi Pā. Along with many of his generation, Te Hori established the nature of the relationship Ngāi Tahu would have with Pākehā. In 1861 the phrase ‘kia atawhai ki te iwi’ – be kind to your people – was repeated by Pita Te Hori to the city’s leaders. Today it guides what Ngāi Tūāhuriri values in the recovery journey – care for the citizens of the city, and a warm welcome within new establishments. In 1995, Ngāi Tahu, exercising the First Right of Refusal provision in The Ngāi Tahu Land Bank arrangement, moved to purchase the site outright from the Crown. The Wigram Airforce Base purchase was on a similar basis. These transactions were a consequence of the Treaty settlement process but the prior purchase meant that they were excluded from the settlement calculation. Following the deconstruction of the barracks in 2000, the site was converted to a car park. The police station was imploded in September 2014 when damage sustained during the 2010-2012 earthquakes made it uneconomical to repair. 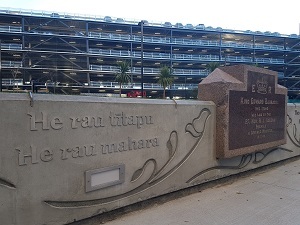 This paved the way for a development which tells the story of our shared history, honouring those who have gone before, and representing the core of Ngāi Tahu’s property investment strategy – hosting the Crown on our own footprint and having land which is once again our own in the city of Ōtautahi. On Thursday 10 August 2017, in recognition of their connection to the site, kaumātua Charlie Crofts and Tā Tipene O’Regan officially opened the Pita Te Hori Centre, assisted by Kaiwhakahaere Lisa Tumahai and Mayor of Christchurch Lianne Dalziel. Ngāi Tahu values are woven through the development. 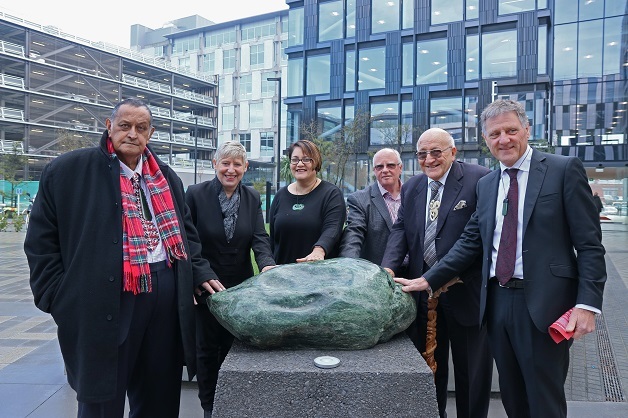 A pounamu touchstone gifted by Te Rūnanga o Ngāti Waewae welcomes and connect visitors to the site. It is named Kaikanui after the name of the kāika set up by Ngāti Waewae as an outpost to Kaiapoi Pā, on the north side of the Waimakariri River near the Kaikanui River. 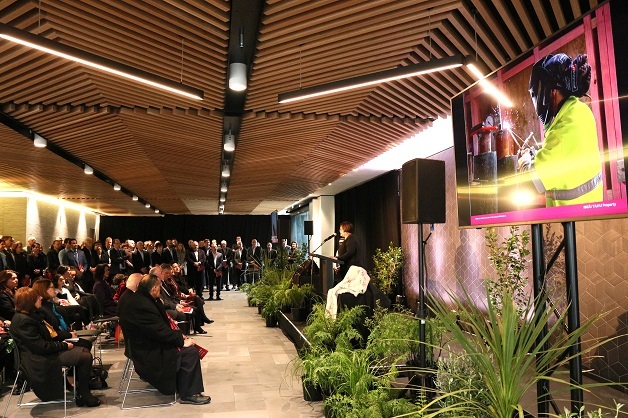 The two buildings, whose names Te Urutī and Iwikau were gifted by Ngāi Tūāhuriri, incorporate sophisticated earthquake safety technology and innovative energy efficiencies. Between the buildings is a large landscaped space, Ngā Māra a Te Wera, layered with historical and cultural significance. Abundant native and exotic plantings such as kōuka, kōwhai, tōtara, and cherry trees, reflect the site’s rich history. A raised lawn on the south side, dubbed Veterans’ Corner, honours those who have served and the original King Edward Barracks foundation stone is also in the gardens. Pupu Harakeke, a work by Auckland sculptor Virginia King, commemorates Lisa Willems (a former staff member of tenant EY) who tragically died in the 2011 earthquake. 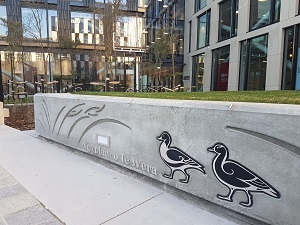 A work by Ngāi Tahu sculptor Priscilla Cowie – Kirihao (Resilience) – celebrates the importance of tuna (eel) and the site’s association with mahinga kai. The gardens will also feature storyboards about Te Wera, the Ngāi Tahu warrior chief who is commemorated there, along with information on Tūāhuriri and the site’s European, military and police history. The first and most important question in Māori relationships is ‘No hea koe?’ – ‘Where are you from?’. The mana whenua from which you spring requires a footprint. With the Pita te Hori Centre in central Ōtautahi we can now celebrate the recovery of a substantial part of our territorial footprint, gifted to us by our ancestors. We look forward to the time when we’ll have a comparable footprint in other centres in the takiwā: Mō tātou, ā, mō ka uri, a muri ake nei – for us, and for our children after us.